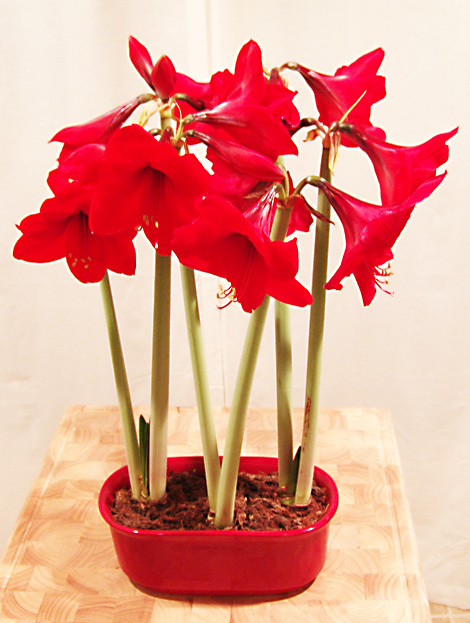 These Amaryllis bulbs were dirt-covered lumps of vegetable matter just a few weeks ago and they have exploded into a frenzy of color with a little encouragement from Gretchen. This area of Virginia is still in the grip of winter, but these flowers brighten our kitchen and hold out the promise of Spring to come. The temperature is below freezing and is steadily dropping up here on our ridge in these dark hours before dawn, but a fire burns brightly in the wood stove and I am planning more work to be done on the house. I am hard-wiring the house for high speed internet after experiencing the painful realities of wireless networking. Wireless internet is a nice trick, but we found it to be unreliable. Anything we have to fiddle with is too much trouble to use. We will use the conventional network hardware that has proved reliable for so many years. I am also designing a sliding door for the entrance to our 6-foot-high crawl space under the house. It will be similar to a sliding shed door and will allow us to get maximum use of the opening. I will design and build the door and have already located the necessary door hardware on the Internet. We may be snowbound for the next few days, so it will be a time to catch up on chores and projects that can be done indoors.